You're in a multiple deck game in which soft doubling is allowed. You're dealt an Ace-seven hand, which of course gives you a total of either eight or 18, depending on what makes better sense to you. 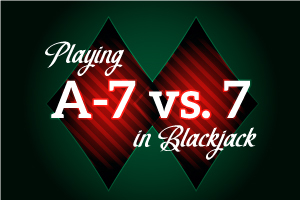 The dealer turns up a seven as his upcard. Now, in this situation you've got a choice between standing, hitting, or doubling down. If you hit you'll have the added flexibility of playing with the soft hand. Which of these options do you choose? This may come as a surprise to some people, but you will actually stand with this hand. And obviously, it deserves an explanation. Remember always that when you receive a hand like this, it's not "soft 18"; nor is it "8 or 18." It's properly referred to, for our purposes, as "Ace-seven." The logistics of this situation are that with a total of 18 you're in pretty good shape when the dealer has a 7 as the upcard, since there's a relatively good chance he's looking at a 17 (with a ten-value card) or a busting hand. The dealer would have to beat you with 19 or better, and in this situation, it's going to happen only about 23% of the time. Indeed, if you double down here you will win at a 51% rate and lose about 40% of your hands. By standing, you're only going to lose 23% of your hands. So even though the double may seem tempting, it's not the way to go here. And simply hitting the hand can't really do anything but weaken your position, because improving it will be difficult. Stand pat with the Ace-seven and bring home a winner.